January 5, 2014 | Lens cap....off! Different night, different hotel. I kind like the digs I’m in now better than last night (I have a fancy ‘relax packet’ that includes a lovely Calming Mist to help drift me off to sleep). The hallways are better, but I didn’t take a picture of those. This place does have cool architecture, and I spent a good ten minutes in the lobby taking pictures of various things at various angles. But since this more about me learning to use my camera rather than taking a cool looking picture, I’m putting up a shot that impressed me purely from a technical standpoint. Lesson learned today: Sometimes it’s better to let the camera do the work. I gave in to the Auto setting a couple of times as I was working my way through the settings. Lighting seemed to be all over the map, and I tried to be a Photographer, capturing angles and such. 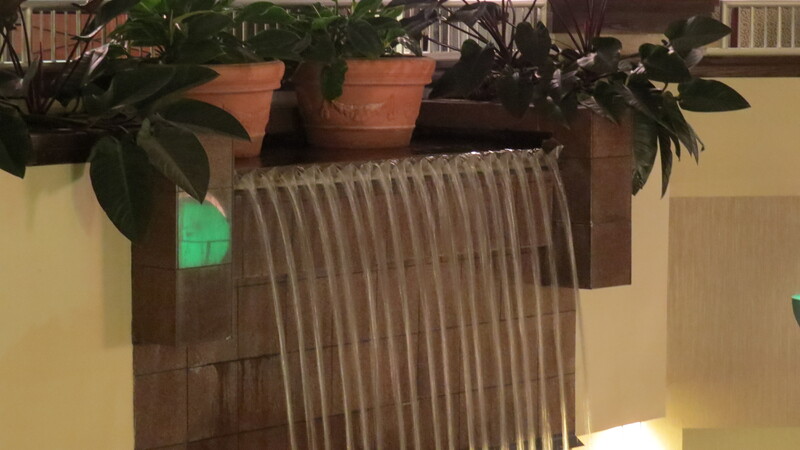 There was a running fountain, and I took a picture of it, not expecting much. I don’t what exactly impresses me about the shot itself, but perhaps it’s what the camera did. Try as a I might, I couldn’t get a shot of the water to look as decent as the camera. Well done, Canon. You won this time. Day 5, goodnight. I’m off to rub some “soothing balm” on the tootsies before bed. I wonder if I can shower under that thing?